Editor’s Note: The following is from Bill Haltom’s book In Search of Hamilton Burger: The Trials and Tribulations of a Southern Lawyer. In the spring of 1973, I was an undergraduate majoring in Football Appreciation at the University of Tennessee. Like a lot of college students, I skipped several classes that spring, and I’ve got the transcript to prove it. But I didn’t cut class in May of 1973 to throw a Frisbee or to enjoy springtime in the mountains of East Tennessee. No, I skipped several classes that spring so that I could sit in front of my black-and-white TV in my apartment and watch a couple of mountain lawyers save the Constitution of the United States. At first glance on my TV screen, these two mountain lawyers had little in common. One was old; the other young. One was a life-long yeller-dog Democrat. The other was a born-and-baptized Republican, the son of a GOP congressman. One was from North Carolina, and the other was from Tennessee. One had gone to Harvard. The other had gone to the University of Tennessee, and therefore in my impartial opinion, was the better-educated. But they had two things in common. First, they were both from small towns in the mountains of the southeast United States. And like most mountain people, they had a strong sense of history and a commitment to their faith, their families and their friends. And second, they were both trial lawyers. They had both spent many years of their lives trying cases before juries comprised of mountain folks. And based on that experience, both men had enormous respect for the common sense and fairness of ordinary people, particularly when they are brought together to resolve a dispute. Fate cast these two mountain lawyers to sit side by side in a nationally-televised trial in the spring of 1973. The trial didn’t take place in a courtroom. It took place in a hearing room in the U.S. Capitol in Washington. But make no mistake about it, it was a trial all right. The “defendant” was the incumbent president of the United States who had just been re-elected in the greatest landslide in American political history. And the jury? Well, I served on that jury, along with about 50 million other Americans who watched the televised hearings. As the trial went on through the spring and into the summer of 1973, the two mountain lawyers did what trial lawyers do best. They asked incisive questions and made incisive comments. By the end of the summer of ‘73, the answers to the young mountain lawyer’s persistent questions had emerged. And approximately a year later, for the first time in history, an American president resigned from office. The old mountain lawyer was named Sam Ervin. The young mountain lawyer was named Howard Baker. They represented the legal profession at its very best. And during that remarkable spring and summer of 1973, they did nothing less than save the Constitution of the United States. 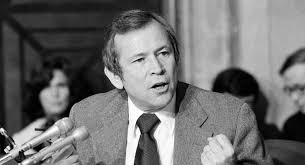 Sam Blair: Howard Baker as a relatively young Republican was a shining star for democracy asking questions concerning a sitting Republican President. Nick McCall: Truly, Senator Sam and Howard Baker were both "men for all seasons," and your quotation from Sam Ervin is one of the deepest and most powerful things he said in a legendary and historic time; relevant then, and relevant now. Thanks for sharing, my friend.